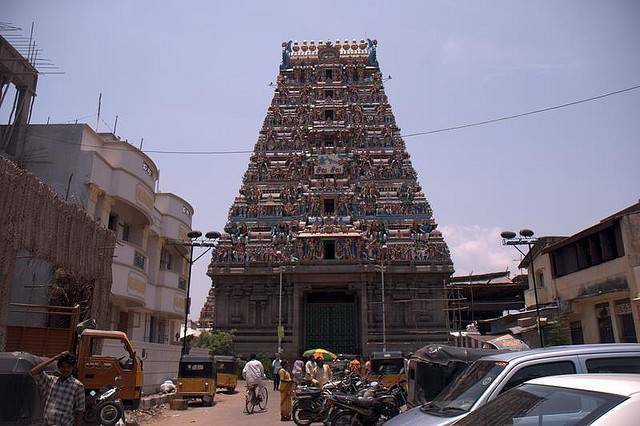 Vadapalani Murugan Temple is dedicated to Lord Murugan and is located in Vadapalani area of Chennai. Since the main Idol of Lord Murugan is same as that of Palani Temple, one which is located in southern part of Tamil Nadu, the temple got the name Vadapalani Temple (means Northern Palani Temple). And thus the region of Chennai in which the temple is situated derived its name, Vadapalani. Temple which is 125 years old is just a small hut built with Palm fronds, in which a painting of Lord Murugan is kept and worshipped. Now, it is much popular religious center in Chennai. Apart from main shrine for Lord Murugan, there are small shrines around the circumlocution for various gods. The Gopurams has colorful stucco figures and statues depicting 108 Bharatanatyam postures. In front of the temple there is a huge water tank. Approximately 7000 weddings are held annually in Vadapalani Temple.